With over 30 years of coffee roasting experience, we fully understand what it means to maximize the natural flavors in each bean. We develop distinct profiles for each varietal and slowly caramelize the sugars inside to produce consistently smooth, full-bodied coffees. This method of slow roasting gives Empire’s coffee a distinctly rich flavor. In addition, we roast each coffee separately and blend afterwards using the BAR (Blend After Roasting) method. By roasting each coffee individually and only blending after, unlike many other roasters, we ensure a level of consistency in both the roast shade and flavor of a blend. This BAR process is more labor intensive, but we think it’s the only way to roast for optimal blending. 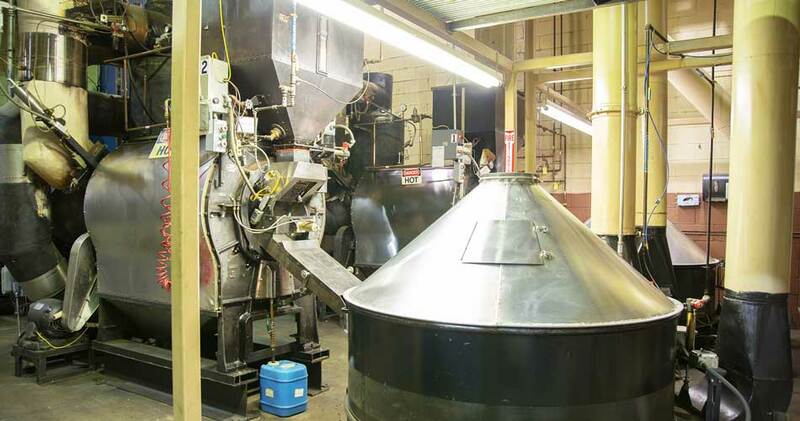 As primarily a private label coffee roaster, our two large Jebez Burns 500-pound roasters are fed continuously throughout the day. Green coffee is dumped into the surge hoppers above each roaster approximately every 15 minutes, depending on the roast we are trying to achieve. 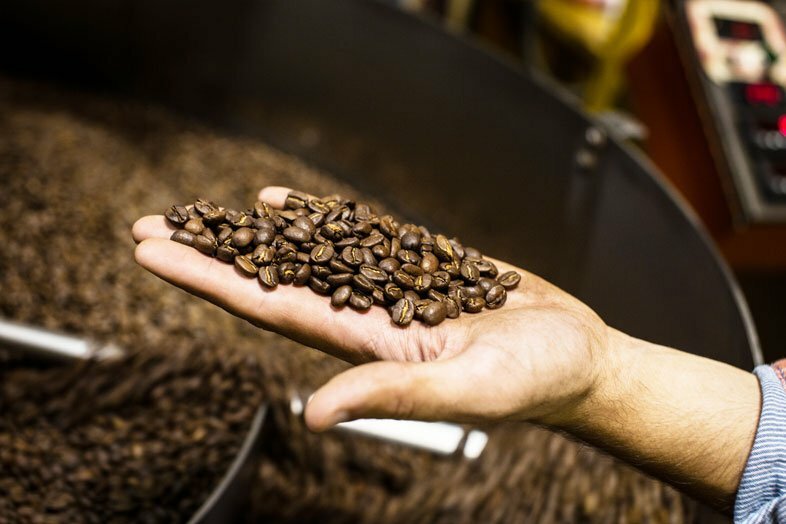 Each roaster is computer controlled and overseen by a team of dedicated, highly-experienced roasters and their support staff. Because our two Jebez Burns roasters roast such large volumes of coffee during each cycle, it’s imperative to stop the roasting process before coffee becomes over-roasted. To do that, anywhere between 1-8 gallons of filtered water is sprayed into the perforated roast drum to start the cooling process. This water has no effect on the coffee itself, except to aid in the cooling down process before coffee is ejected into the cooling carts. Moments later, the entire roast is dumped into the adjoining cooling carts where the coffee is raked along a perforated base as air is pumped up through the grates. This quick cooling method is extremely important because the coffee must be cool to the touch before moving into the holding silos. Empire is able to roast approximately 4,000 pounds per hour across both of its Jebez Burns roasters. 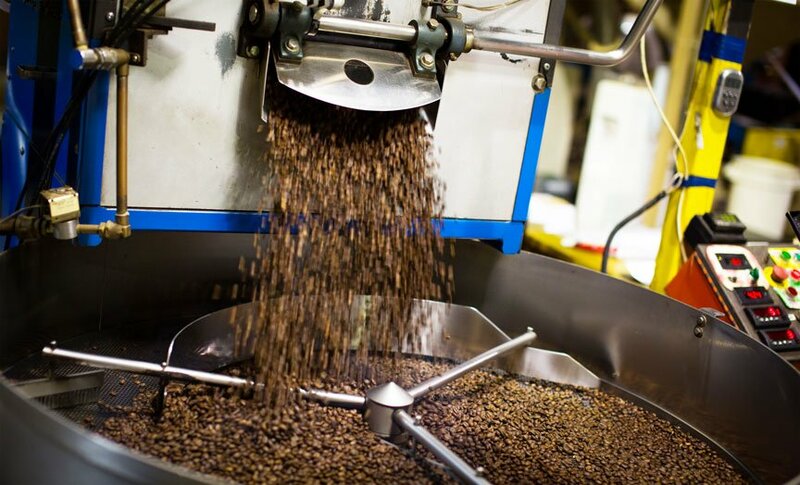 Empire has a 30-kilo (66-pound) Diedrich roaster that is used to roast our specialty coffees. This dry roaster requires no cooling spray like our Jebez Burns roasters, but the manually operated roaster does need to be closely watched by a seasoned roaster. The Diedrich roaster is controlled entirely by hand and sight. There is no computer making adjustments or operating the roaster at any time. In addition, the Roast Master needs to time the final moments so as not to over-roast the coffee. Though this process requires much more hands-on attention, Empire is able to consistently produce rich, delicious coffee through rigorous training and quality control measures.